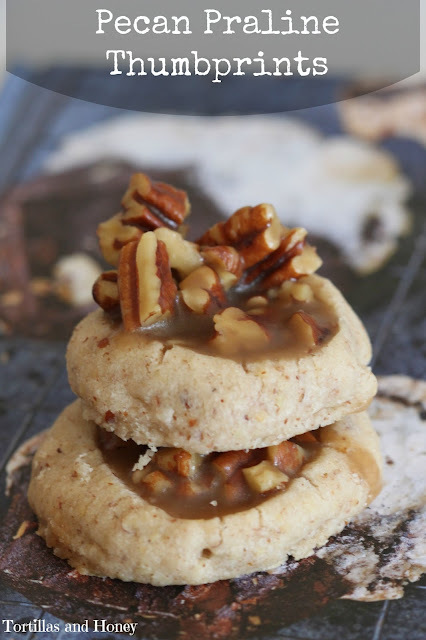 Today I am so excited to share with you a wonderful recipe (Pecan Praline Thumbprints) and a totally inspired cookbook (Cookie Love) by Mindy Segal! Both the recipe and the cookbook have become quick favorites of mine, and I am having a great time working my way through this cookbook. Below I am sharing with you a review and a recipe-- I hope that you enjoy!! This is not your average cookbook and Mindy Segal is not your average cookie baker. She's a James Beard Award Foundation winner, and she also owns a highly acclaimed restaurant in Chicago called Mindy's Hot Chocolate. This cookbook is definitely not for those looking for Betty Crocker style recipes. The cookies in this cookbook are unique and some of the ingredients are a little more unusual and harder to find. If that doesn't appeal to you, this book isn't for you. That is my disclaimer. That said, I found myself not put off by some of the more unusual ingredients with the exception of goat butter in a couple recipes. However, Mindy stated that she's not a fan of goat's milk but loves goat butter-- so I MIGHT try the goat butter recipes. She also uses smoked sugar, smoked sea salt, rose water, cocoa nibs, and orange blossom water in some of her recipes, but states that most of these ingredients you should be able to find at Whole Foods. I found myself making a list of ingredients for the next time I'm at Whole Foods so that I can hunt down some of these ingredients! I have made several cookies in this cookbook already! I have never been so excited to try so many recipes, and I anxiously await for the next opportunity to make other recipes in this book. So far I've made the Pecan Praline Thumbprints (see below), Brownie Krinkles, Oatmeal Scotchies, and Mandlebrodt. All of these recipes have been so delicious and everyone has been raving about these recipes. My mom actually loved the Mandelbrodt (which is like a Jewish biscotti) so much that she literally hid the entire batch I brought over to her house for my family to share! Some recipes in the future that I cannot wait to try, which are some that have the ingredients I don't have handy, include Hot Chocolate Thumbprint Cookies, the Blondie Buttercotch S'mores, Smoky Bacon Candy Bar Cookies, and the Raspberry Rose Rugelach. The only thing I'd advise those that make recipes in this book is to watch your salt. Mindy likes to use a mix of Kosher salt and sea salt flakes. Depending on the brands of salt you use, you may want to reduce the amount of salt in these recipes because they may be a tad salty. But use your judgement. This cookbook has quickly become one of my favorite and most beloved cookbooks that I own. I find the recipes incredible inspired and I cannot wait to try more of her recipes! Pralines are one of my ultimate favorite desserts so when I saw this recipe for Pecan Praline Thumbprints, I knew this would be the first recipe that I would try from this cookbook. So let me tell you about this cookie: the base is a Mexican Wedding Cookie and the thumbprint filling is a southern praline. Like, seriously!! Whenever I tell others about these cookies, their eyes widen in disbelief and awe which are some wonderful reactions. These cookies are absolutely divine! I will be making these again and again. My brother's girlfriend also told me that these are some of her favorite cookies that I've ever made. The praline in this recipe is a softer version and it does not completely harden when it sets. So these must be kept in the fridge or they will be too soft! As stated above, careful with the salt-- depending on the salts you use, you may want to cut the salt or they may be too salty. In a food processor, pulse the pecans and 1/4 c. of the granulated sugar until a fine meals forms but before the nuts start to release their oils. In the bowl of a stand mixer fitted with a paddle attachment, mix the butter briefly on medium speed for 5-10 seconds. Add the remaining 1/2 c. granulated sugar and beat together until the butter mixture is aerated and pale in color, approximately 4 minutes. Briefly beat in the vanilla. Scrape the sides and bottom of the bowl with a rubber spatula to bring the batter together. In a bowl, whisk together the flour and salts. Add the dry ingredients all at once and mix on low speed until the dough comes together but still looks shaggy, approximately 30 seconds. Scrape the sides and bottom of the bowl to bring the batter together. Mix for another 10 seconds on medium speed. Remove the bowl from the stand mixer. With a plastic bench scraper, bring the dough together completely by hand. Stretch out a long sheet of plastic wrap on a work surface and put the dough on top. Pat into an 8-inch square, using the bench scraper to square off the sides. Wrap tightly and refrigerate until chilled throughout, at least 30 minutes or up to 3 days. Heat the oven to 350. Line a couple of half sheet (13x18-inch) pans with parchment paper. Cut the dough into 6 even strips. Roll the strips back and forth into logs to round out the edges. Using the top half of your thumb as a guide, cut each log into 8 pieces but keep the log together. Roll the logs again to round out the edges, then pull the pieces apart and place cut side up on the prepared pans, evenly spacing 20 cookies per pan. With the tip of your index finger, make an indentation into the center of each cookie. Bake one pan at a time for 8 minutes. Remove the pan from the oven and tap down the centers with the rounded end of a wooden spoon or a cocktail muddler. Rotate the pan and bake until the cookies have slight cracks on top and are set, another 4-6 minutes. When ready, the cookies will have set around the edges and you will be able to gently move them, but they still will be soft. Let the cookies cool completely on the pan. Repeat with the remaining pan. While the cookies are baking, start the praline. While the thumbprints are still warm, use a small spoon to scoop the goopy praline into the centers. (It is okay if some spills over the sides.) Refrigerate until set, approximately 30 minutes. Wow, I would love a few of these cookies for dessert. I love pecan pralines and these look perfect! This book has been on my amazon to get list for a while. I need to finally grab it. These cookies look amazing!